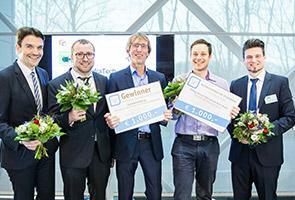 "Screen flushing”, a cleaning method of drinkingwater pipes by Gelsenwasser AG, has been awarded with the InfraTech Innovation Prize 2018. This competition was being organised by the IKT (institute for Underground infrastructure). The prize for talented students, which has been awarded for the first time, went to Philipp Hensel for his contribution: "After-treatment in connection with the elimination of trace-elements by oxidation with ozone".